A simulation of how the transit will appear from Ashburn. On 9 May 2016, Mercury will pass in front of the Sun, casting a small black silhouette in front of the solar disk from 07:12 until 14:42 EDT. The transit will be visible from any location where the Sun is above the horizon between these times, including from Africa, the Americas, Asia and Europe. This will be the first transit of the planet since November 2006, and the last until November 2019. Mercury passes between the Earth and Sun on average once every 116 days, each time it as moves from the evening sky into the morning sky, at inferior solar conjunction. It rarely passes directly in front of the Sun, however. Mercury's orbit is inclined at 7° to the Earth–Sun plane, which means it usually passes to one side of the Sun. The diagram below show the inclination of Mercury's orbit with respect to the Earth–Sun plane, which is represented by the grid (Mercury's orbit is not drawn to scale). Mercury only passes in front of the Sun's disk if it happens to be at inferior conjunction when it is also passing through the Earth–Sun plane. Mercury passes through this plane twice on each orbit around the Sun, roughly once every 44 days, at the points on the left and right of the diagram labelled as nodes. However, this only coincides with Mercury being at inferior conjunction on average only once every 7-8 years. Each time, a transit can be seen from any location where the Sun is above the horizon at the time. For a newcomer, perhaps the most striking thing about a transit of Mercury is how small the planet appears in comparison to the Sun. At inferior conjunction, Mercury measures a mere 12 arcseconds across, about 150 times smaller than the Sun. This makes transits of Mercury significantly trickier to observe than other solar phenomena such as eclipses and even transits of Venus. Mercury's silhouette is not visible without some form of magnification. As a result, it is especially important to emphasise that the Sun is a dangerous object to observe. Viewing it through any optical instrument – even a pair of binoculars or the finderscope on the side of your telescope – can cause instant and permanent blindness. 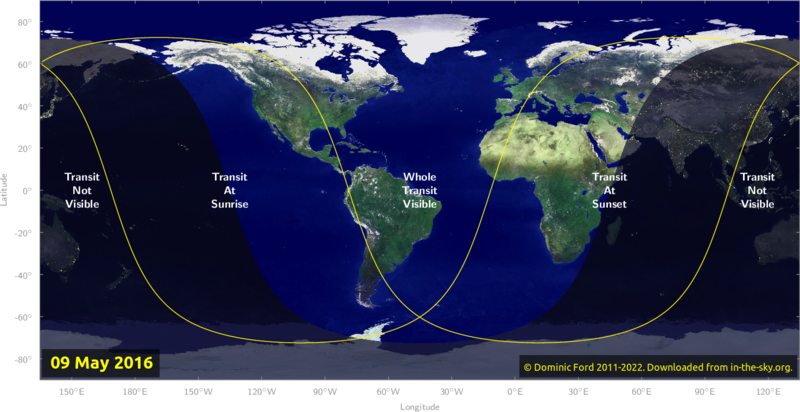 Map of where the transit will be visible. Click here to expand. If you have any doubts about what equipment to use, by far the safest thing to do is to go along to a public observing event. Many astronomical societies are likely to be hosting observing events on the day, and they'll be sure to welcome newcomers. You may meet some new people at the same time as seeing the transit. The safest way to view the transit yourself is to buy a purpose-built solar projection box. BAA Solar Section Director Lyn Smith demonstrates how to project an image of the Sun onto a piece of white card using a small refractor. If you have access to a telescope, you may be able to use it to observe the Sun. Remember, though, that you must never look through the telescope, or even the finderscope, when either is pointing anywhere close to the Sun. To ensure you don't forget, it's best to remove the finderscope or leave its lens covers on. If you have a refractor or small Newtonian telescope, you can quite easily project an image of the Sun onto a piece of white card. You should not attempt to do this with a Schmidt-Cassegrain (SCT) or Maksutov telescope, as you may permanently damage your telescope. If you are unsure what kind of telescope you have, check first. Many telescopes sold to beginners are of the Schmidt-Cassegrain design. To project an image of the Sun, you simply need to fit a cheap low-power eyepiece into your telescope and hold a piece of card 30-40 centimetres away from it. Avoid using expensive eyepieces when doing this, as there is always a risk that the eyepiece will crack under the Sun's heat. Such damage will not be covered under any guarantee, and may cost you a great deal of money. You should also avoid eyepieces made from plastic, as they are liable to melt. Aiming your telescope at the Sun can be a challenge at first. You must not use a finderscope, as looking at the Sun through this is just as dangerous as with any other optical instrument. Sighting the Sun along the edge of the tube must also be avoided, since your eyes can be damaged by looking directly at the Sun even without magnification. The best way to aim the telescope is to look at the shadow of your telescope tube on the ground. When the telescope is pointing to one side of the Sun, the shadow will appear as an elongated oval. If you move the telescope into better alignment with the Sun, its shadow will get smaller and become more circular. Once you have oriented the telescope to make the shadow as small and circular as possible, it should be pointing in almost the right direction. Try projecting an image onto a piece of card. You may need to scan the telescope from side to side until it comes into view. Using a low-power eyepiece will make this easier. The key is to be patient and to practice! When projected an image of the Sun, you must take extreme caution to ensure no one looks through the eyepiece, especially if you are observing with children. Even touching the eyepiece can be painful, as it will rapidly become extremely hot. Also take care not to pass your hand close to the eyepiece, such that the Sun's light is focused onto it. This can cause painful burns in an instant. Do not leave the telescope unattended at any time. If you need to take a break, move the telescope away from the Sun. This will give the eyepiece a chance to cool off as well as ensuring no one injures themselves. It is best to leave the telescope pointing to the east of the Sun, because then you can be sure that the Sun won't drift back into the field of view. In the northern hemisphere, this means pointing the telescope to the left of the Sun. These hazards aside, this is much the safest way to observe the Sun with a telescope. If you're careful, the worst that can happen is that you may lose an eyepiece if it shatters under the heat. The risks can be minimised by ensuring the aperture of the telescope is no larger than 60mm. If your telescope is larger than this, fix a piece of cardboard over the front and cut a 60mm disk out of the middle. This will reduce the amount of light entering the telescope. A solar filter fitted over the front of a Schmidt-Cassegrain telescope. It is also possible to buy special filters which you can fit over the front of your telescope, and which allow you to look directly through the telescope at the Sun. It is essential that the filter fixes very securely to your telescope, that it is undamaged, and that it is designed for safe use with your telescope. Only buy from reputable suppliers you trust, and thoroughly inspect your filters for damage every time you use them. This is the only safe way to view the transit with a Schmidt-Cassegrain telescope. Some filters are sold which are designed to be fitted to the eyepiece end of the telescope, rather than over the front. We recommend that these should never be used under any circumstances. They are often of suspect quality, and can crack under the Sun's heat, exposing you to the Sun's full light. If you make a filter yourself, the only safe option is to buy a sheet of Mylar or Baader Astro Solar Film from a reputable optical supplier, and ensure that it is fixed very securely in place. If there is the slightest scratch or pinhole, you should discard the filter and make or buy a new one. DO view the Sun ONLY through special filters made specifically for safe solar viewing. Ensure they are DESIGNED to be fitted SECURELY to the kind of instrument you have. These include, e.g. 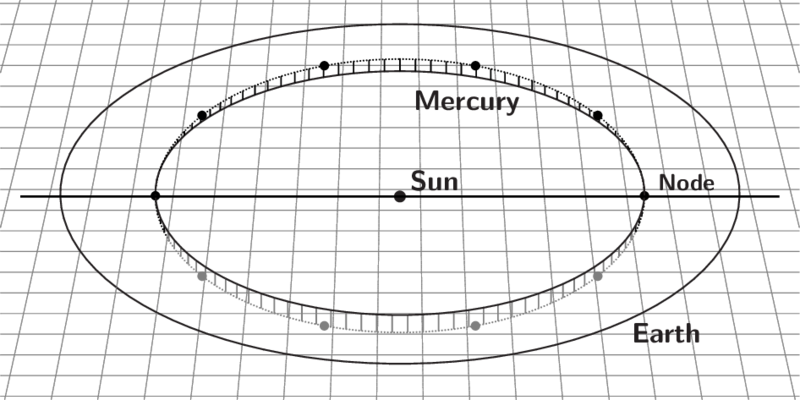 aluminised Mylar filters, or black polymer filters, identified as suitable for direct viewing of the Sun, bearing the CE mark AND a statement that it conforms to European Community Directive 89/686/EEC. Always read and follow the manufacturer's instructions carefully. DON'T fit any filter to a telescope without FIRST checking it thoroughly for damage. If it is scuffed, scratched, has pinholes in it, or you have any other doubts about it at all, DON'T use it. To repeat that again: if you are not certain that a filter is approved and safe, or you have any other doubts, DON'T USE IT. For more information about safely observing the Sun, we recommend Lee Macdonald's excellent book How to Observe the Sun Safely , published by Springer in 2012. Mercury 03h07m40s +17°34' Aries 12.1"